Dr. George Schweitzer comes to Spokane. Morning came quickly and we had cereal and juice before heading to the Baptist Church for browsing the vendors and looking for the rooms we were going to be in later in the day. The first session was Patricia Walls Stamm in the Sanctuary. We headed for the Sanctuary and found a seat near the middle, but there was a cold breeze from the back, so we moved to the side away from the cold breeze. Patricia's first talk was Death has Many Faces on finding various ways to document a death. Patricia moves a lot during her talks and I took many pictures of the side or back of her head before I finally got this good one of her looking towards me. Now comes the hard part of the conference the breakout sessions. Why are they so hard? Well the first section had five topics and I really wanted to go to four of them, but finally settled on Carol Buswell from NARA in Seattle on Immigration and Naturalization Records in the National Archives. She had handouts for all the census including the 1940 census. Each sheet showed all the columns on the census and what was supposed to be in that column. The class was full and several people brought chairs from the hall to have a place to sit. Next Back to the Sanctuary for the third section with Patricia Walls Stamm, this section was Elements of a Useful Research Road Map. This was an interesting section on how to do research and what to do when you have found the documents you were looking for. Lunch was next and it was a buffet dinner where you made your own sandwich and some condiments and side dishes to go along with it. 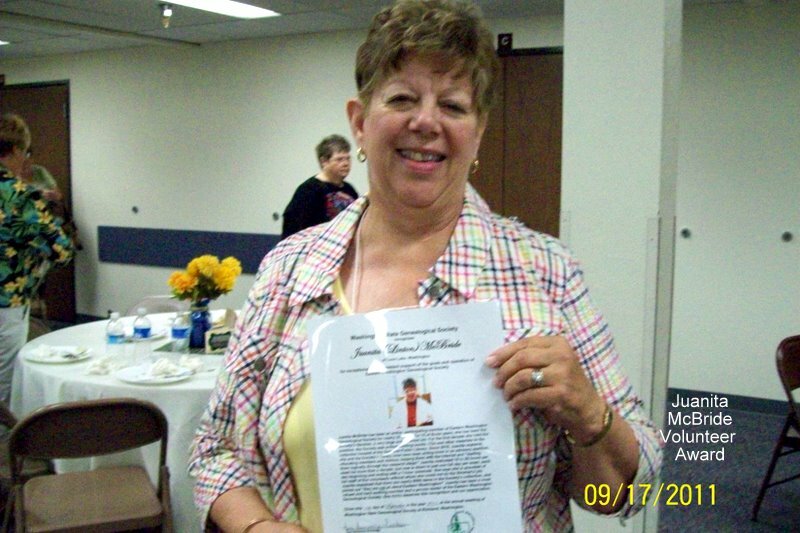 Lunch also includes the Annual Meeting of the Washington State Genealogical Society, so the minutes of the last meeting, the treasurers report, and then some awards to genealogical society volunteers. 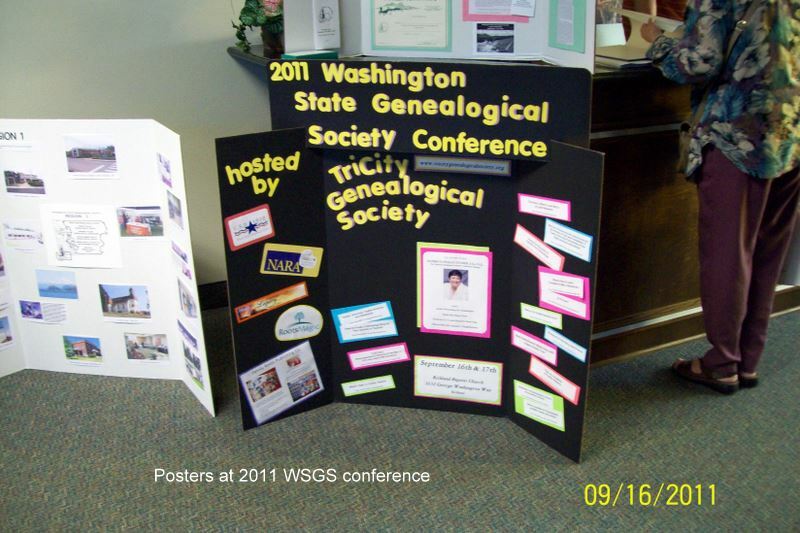 Juanita McBride was one of two from Eastern Washington Genealogical Society (below). Dorothy Braithwait was the second but she did not attend. 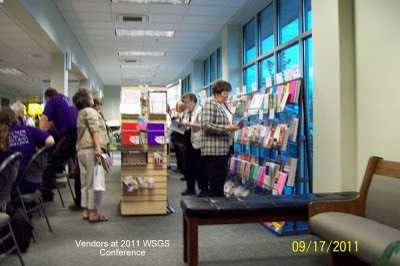 There was supposed to be committee Reports next, but the volunteer awards took so long there was not time, so just a quick message about next years conference September 7-8, 2012 at Port Angeles, Washington. My committee report was to be I finished three counties this year Whitman, Walla Walla and Whatcom counties so the only county not in the WSGS Resource Guides is Snohomish county. 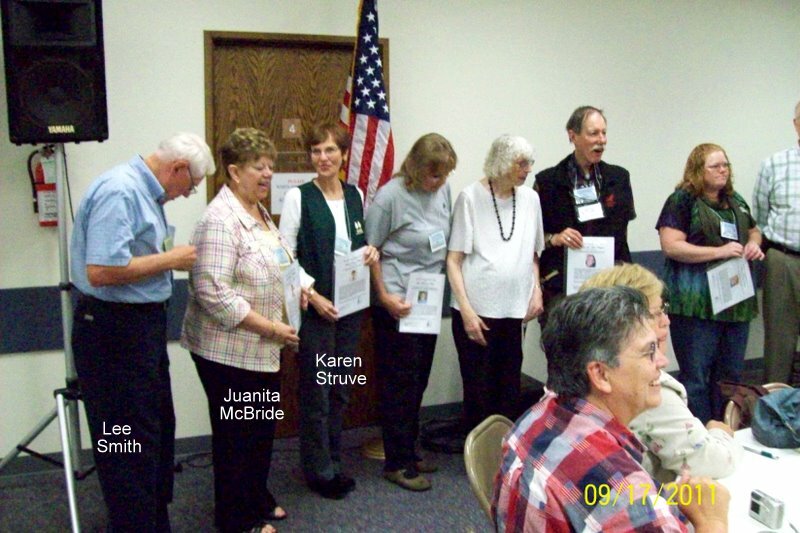 This is a picture of the whole group of genealogical society volunteers, congratulations everyone. After lunch was two breakout sessions, and while each had five selections, I really was not a lot interested in the first group of five, but I picked the one by Linda Lind on finding the War of 1812 Veterans that died in Washington Territory. You would think they would be easy to find but most records do not list War of 1812 veterans. Linda did give a clue on finding a War of 1812 veteran, by using the Government Land Office Records, and searching for the person in the list of Land Patents. They do not have to be from Washington to use this database, but since it is online it is a quick way to find a War of 1812 Veteran. The next breakout I wanted to attend two sessions, but picked Margie Beldin; Google; The Genealogist's Research Assistant. Margie is an excellent teacher and her session flew by so quickly you hardly knew you were learning so much so quickly. The last session by Patricia Walls Stamm was Discovering Your Ancestors Neighborhood, another good session on local records. Well hard to believe it was all over except the door prizes and while I was close a couple of times I did not win anything, but Jacque won a $25.00 gift certificate. My sister Jacque & I left Spokane about 8:30 a.m. September 16, 2011 heading for Richland, Washington and the 2011 WSGS Conference Building Ancestral Bridges. This was a fitting name for the Richland, Pasco and Kennewick area has many bridges crossing the Columbia River. We arrived about noon and leveled the mini-home so the refrigerator keeps working. We warmed up some frozen home made soup and some corn from our garden for lunch and then I headed for the WSGS board meeting at 3 p.m. since I am a committee chairman. After the meeting I picked up my registration paper sack with all the goodies the Tri Cities Genealogical Society had worked so hard to collect and put in all the bags. 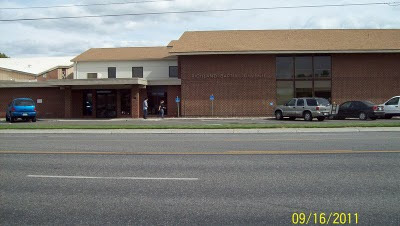 This first picture is the Richland Baptist Church. 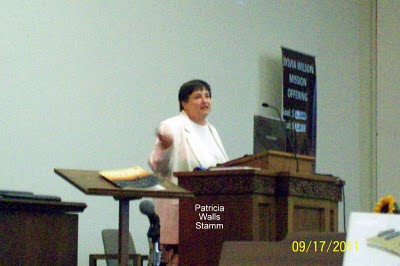 I always thought the church I went to here in Spokane was pretty big, but this Baptist Church was really huge, the Sanctuary where Patricia Walls Stamm talked was bigger than my whole church. 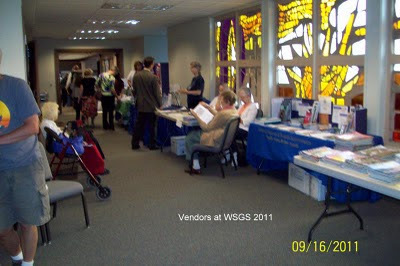 When we arrived the vendors were busy setting up, and as these pictures show, were busy during the two days of the conference. 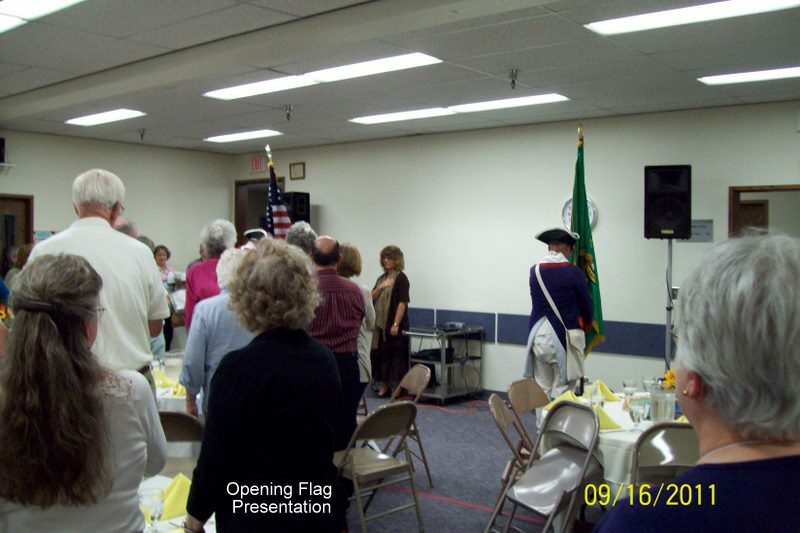 This was the opening Flag Ceremony by the SAR group from Spangle, Washington. 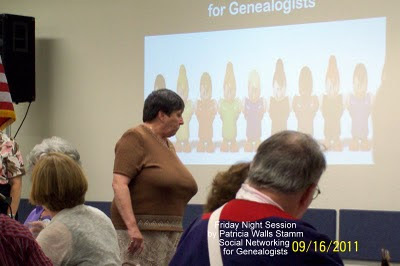 After the good buffet dinner, Patricia Walls Stamm gave the first of four talks; Social Networking for Genealogists where she briefly pointed out the major social working websites, Facebook, Linkedin, My Space, Twitter, YouTube and Flickr. While many of the WSGS board sat together I wanted to meet others so sat at a table away from the board and met Lee Smith one of the TCGS member volunteers that helped put on this conference. He also took many pictures of bridges around the area and they were used as centerpieces, and in the syllabus. If you are a Legacy Family Tree genealogy software user, or are simply curious about this genealogy software program, you may be interested in the Legacy Users Group (LUG), which will meet next Wednesday, September 21st, from 1:30 to 3:30 PM in the meeting room of the Shadle Park Branch of the Spokane Public Library at 2111 W. Wellesley. This meeting is free and open to the public. 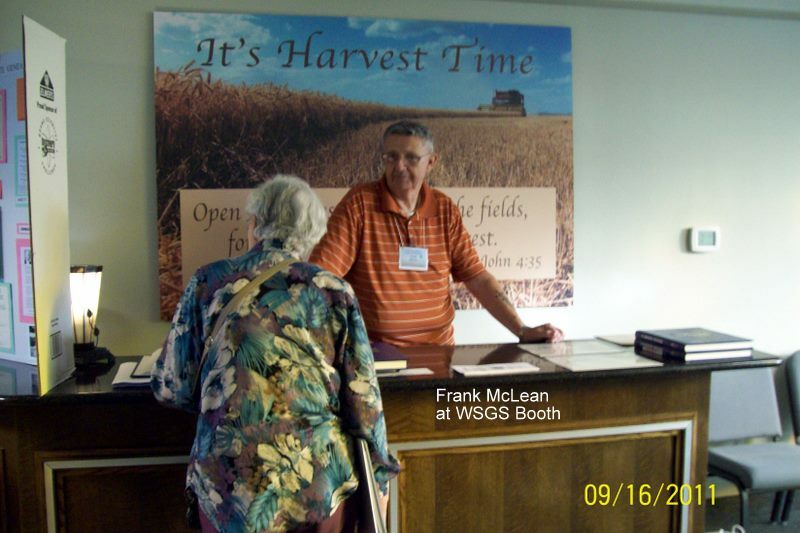 Regular attendees will take turns in the role of moderator for each meeting. If you have more questions, please contact Donna Potter Phillips here. Dr. George Schweitzer coming to teach us about the Civil War on October 1st!! The above group shows some of the many faces of Dr. George Schweitzer (except for the right hand.... think that is his daughter). This brilliant teacher is coming to EWGS on Saturday, October 1st, to teach us about the causes and reasons for the Civil War and how it really was from the northern and the southern viewpoint. I certainly do hope that you are planning to attend.......... click to the EWGS website (www.ewgsi.org) and access the registration flyer there. See you there! Mama Tau....... nothing to do with genealogy! Yesterday I visited Mama Tau, the white lion breeding farm here in Limpopo province, South Africa. It was like visiting Jurassic Park......... the lions are in 5 acre pens behind tall electric fences and you ride about in tall-barred carts. The skinny Afrikanner gent taught us all about their farm and the lions and it was most interesting. What has this to do with genealogy? Sorry, nothing........... don't think any of my ancestors were ever eaten by lions and certainly not white lions. Were yours??? ?